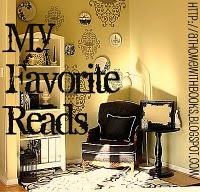 Alyce from At Home With Books features one of her favorite reads each Thursday and this week my pick is a recent favorite of mine. From the inside flap: Narrated by Death, Markus Zusak’s groundbreaking new novel is the story of Liesel Meminger, a young foster girl living outside of Munich in Nazi Germany. Liesel scratches out a meager existence for herself by stealing when she discovers something she can’t resist — books. Soon she is stealing books from Nazi book-burnings, the mayor’s wife’s library, wherever they are to be found. With the help of her accordion-playing foster father, Liesel learns to read and shares her stolen books with her neighbors during bombing raids, as well as with the Jewish man hidden in her basement. There are two things that I love about this book: 1.) it’s about books and, 2.) Death is the narrator. Don’t worry, I’m not giving anything away by telling you that Death narrates this story. He introduces himself on page 1. What it does is lend an amazing quality to this book that’s already set against an incredibly sad backdrop. Liesel is someone you automatically fall in love with. She’s clever, scared, and has seen way too many things for her young age but a good portion of that is due to current circumstances. The story itself is heartbreaking but worth every tear-inducing word on each page of this book. While Death is trying to make sense of the horror strewn landscape of World War II, you learn about his compassion through Liesel’s story. It’s simply a fantastic tale and one you shouldn’t miss. This does sound like a fascinating story. Of course I’ve been hearing about this one everywhere, but now it’s going on my list. I’ve had this one sitting on the shelf for about a year now because I know it’s bound to be sad and depressing. I’ve heard wonderful things about how good it is though, and I know that eventually I’ll be ready to read it. I second this. I resisted reading this because I thought it would be too sad, and then I finally read it and discovered it was both way sadder and way better than I would ever have anticipated. I’ve reread it at least four times. I’ve heard so many good things about this book, and I do plan to read it soon. It’s always out when I’m at the library, but I’m going to put it on hold. I read this book for a second time recently. Both times, I appreciated it was a very good book, but the first time I read it, I was seriously overwhelmed by it. It didn’t affect any other book club members that way. When I read it 3 years later, for my other book club, I was able to enjoy it much more. It is an amazing book, even if not a personal favorite. I loved how she loved books. But the character of Death kind of got on my nerves, so by the time I got to the end I wasn’t enjoying it as much… still a great book, though!